Which is a more popular choice and why - burial or cremation? What is allowed in Christian, Jewish, Buddhist, Hindu and other religious beliefs? How much does a cremation or burial cost? Varies widely. Generally more expensive than cremation. Burial plot and casket are important components of the cost. Average cost for a traditional funeral service with burial and headstone is $6,000 to $10,000 in the United States. Varies widely but generally cheaper than burial. Many funeral homes offer a direct cremation for under $1,000. Eastern religions of Hinduism, Jainism and Buddhism mandate open air cremation. Islam forbids cremation and mandates burial. The Christian world, which for many years was opposed to cremation, has come to a greater acceptance of cremation over the past century. Judaism has a firm anti-cremation stance and requires a timely burial of the dead. The Bahai faith also forbids cremation. Zoroastrians believe that neither cremation nor burial is the right way to dispose of the deceased. Their traditional method of corpse disposal is through ritual exposure in a "Tower of Silence". Although cremation was promoted after the Second World War as environmentally preferable to burial, modern thinking is challenging this. Gas is consumed in the process and harmful pollutants are released into the atmosphere. The major emissions from crematories are: nitrogen oxides, carbon monoxide, sulfur dioxide, particulate matter, mercury, hydrogen fluoride (HF), hydrogen chloride (HCl), NMVOCs, and other heavy metals, in addition to Persistent Organic Pollutants (POP). According to the United Nations Environment Programme report on POP Emission Inventory Guidebook, emissions from crematoria contribute 0.2% of the global emission of dioxins and furans. Another estimate is that cremating a body consumes energy equivalent to a 500-mile car drive and releases 500kg (1,100 lb) of carbon dioxide. Natural decomposition after burial seems less harmful to the environment, especially when a shroud rather than a coffin is used. However, burial is also a known source of certain environmental contaminants. Embalming fluids, for example, are known to contaminate groundwater with mercury, arsenic and formaldehyde. The coffins themselves are another known source of contamination. Another concern is contamination from radioisotopes that entered the body before death or burial. One possible source of isotopes is radiation therapy, although no accumulation of radiation occurs in the most common type of radiation therapy involving high energy photons. However, cremation has no effect on radioisotopes other than to return them to the environment more rapidly (beginning with some spread into the air). Thus, cremation is of no overall help with pollution from this source. Yet another environmental concern, of sorts, is that traditional burial takes up a great deal of space. In a traditional burial the body is buried in a casket made from a variety of materials. In America the casket is often placed inside a concrete vault or liner before burial in the ground. While individually this may not take much room, combined with other burials it can over time cause serious space concerns. Many cemeteries, particularly in Japan and Europe as well as those in larger cities, have run out, or are starting to run out, of permanent space. In Tokyo, for example, traditional burial plots are extremely scarce and expensive, and in London, a space crisis led Harriet Harman to propose re-opening old graves for "double-decker" burials. In general, a cremation is cheaper than a burial. According to the BBC, grave digging can cost upwards of £600 whereas a cremation costs around £200 to £300 in the UK. In the United States, the average cost of cremation is about $2,000 but there is a wide variation in prices. The most basic service is called direct cremation, and many funeral homes offer that service for less than $1,000. But some charge upwards of $4,000 for the same service. While difficult in a time of emotional upheaval and bereavement, it helps to shop around for a good price. In spite of this variation in price, cremations tend to be cheaper than burials. There is no cost for a burial plot or a casket. Not only are over half of all dead bodies in America cremated, about a third are disposed of via direct cremation. Direct cremation is when the body is cremated soon after death, without a funeral service being held beforehand. The bereaved usually hold a memorial service after the cremation. But direct cremation separates the commemoration of the life of the recently deceased from the task of disposing the body. Direct cremation offers two advantages: cost and flexibility. Direct cremation is cheaper because there is no funeral or pre-funeral service before the body is disposed. The body does not need to be embalmed or otherwise prepared in any way for a viewing or wake. There is also no need for a casket. 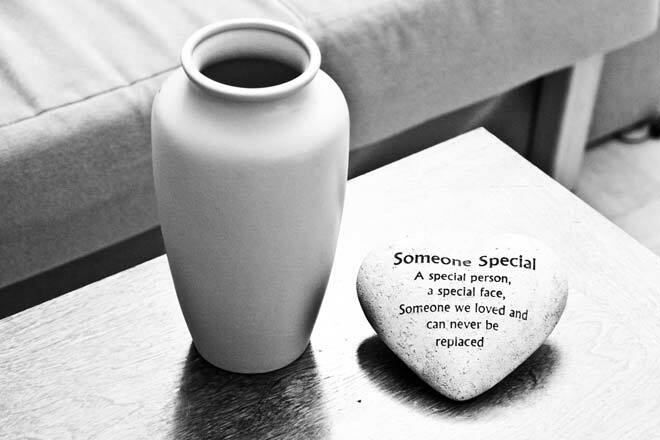 Direct cremation also offers more flexibility around the memorial service. It can be held at a later date when more loved ones can attend. It can be held at a hotel, beach or other venue that was of special importance to the deceased. And the memorial service can include any nontraditional events that would celebrate the life of the deceased in a way that they would have liked. There are two other alternatives to traditional burials and cremations: green burials and alkaline hydrolysis. A green burial eschews embalming, plastics, concrete vaults and most caskets. The body is wrapped in a shroud or willow casket. 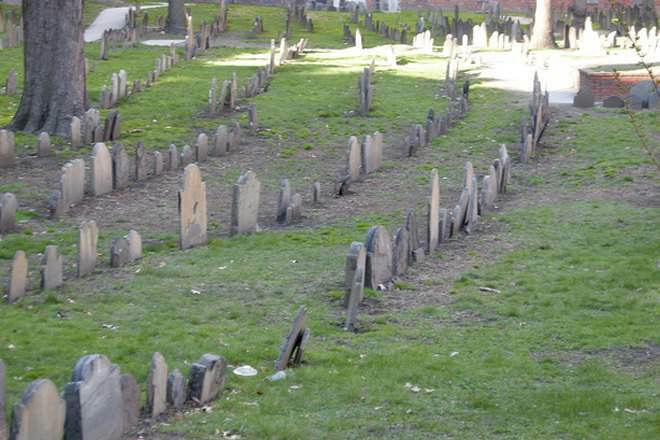 The graves are shallow so that bacteria in the soil can decompose the body. The amount of hardwood used in burials in America is enough to build over 2,000 houses every year. And each year 1.6 million tons of reinforced concrete is used for burial vaults. By not using either, a green burial is a more environment-friendly option. The bones are then typically crushed to dust and the resulting ash is placed in an urn to give to the bereaved family and friends. The effluent is discharged into the sewage system but on rare occasions may be used as fertilizer. A conventional gas-fired crematorium is estimated to emit over 700 lbs (320 kg) of carbon into the atmosphere per body; the carbon footprint of alkaline hydrolysis is about 15% of that. It is possible to plan ahead for both burial and cremation. When pre-buying to make arrangements for your funeral, it is important to pick only a fixed cost option. Do not enter into any contract where the price is not made clear. Also, make your expectations well known—e.g., in a will—so that your family is not subject to pressures of buying a top-of-the-line casket or other expensive burial options. Check out your local chapter of the Funeral Consumer Alliance (FCA) for more helpful tips on planning a funeral. In the United States, about 2.7 million people die every year and more than half of them are cremated. 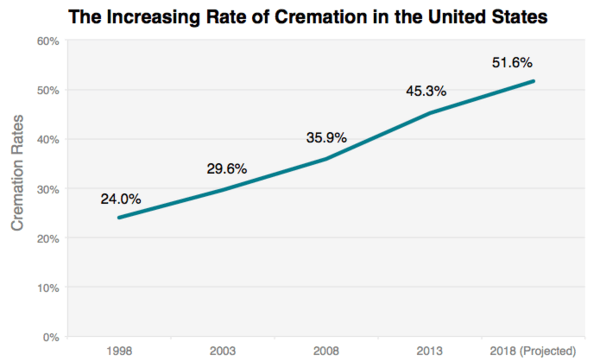 The cremation rate is expected to rise to 79% by 2035. There are over 19,000 funeral homes employing about 120,000 employees and the industry was worth about $16 billion in 2017. Cremation was illegal in Britain until 1884. In the late 19th century and early 20th century, intellectuals, writers and artists in Britain promoted the idea of cremation. By 1940, about 9% of the population chose to be cremated. But now that percentage is over 70. 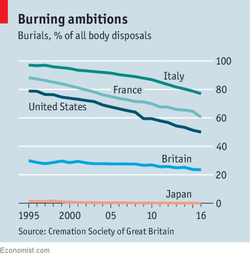 This chart, compiled by The Economist shows the rate of burials as a percentage of disposals for dead bodies, in the United States, Japan, Italy, France and Britain. 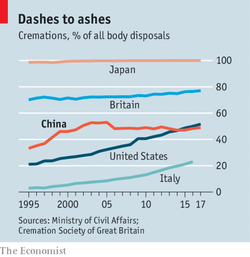 A chart showing cremation as a percentage of body disposals in Japan, Britain, China, Italy and U.S. Chart compiled by The Economist. Burial is still the norm in countries that tend to be more religious, especially Catholic countries like Ireland, which buries 82% of its dead, and Italy (77% burials). In the U.S. and China, over half of the dead bodies are cremated. In Japan, almost all corpses are cremated; the Japanese believe in reincarnation and see cremation as a sort of purification for the next life. In China, the government has a long history of steering their citizens toward cremation, often involunatrily. While Christianity, in recent history has allow cremation, it is not in the Christian tradition. In fact the Bible views the burning of a body a form of judgment and is condemned. Burial is the tradition of both the Jewish and Christian tradition as outlined in Scripture both Old and New Testament. Burial of the body was specified and described in the Bible in every situation recorded. The burial of Abraham, Sarah, Joseph, David, Jesus Christ and the first martyr of the Christian faith Stephan are all described, some in minute detail, in Scripture.